Source Marketing Direct shortlisted for Excellence Award 2 years on the trot! 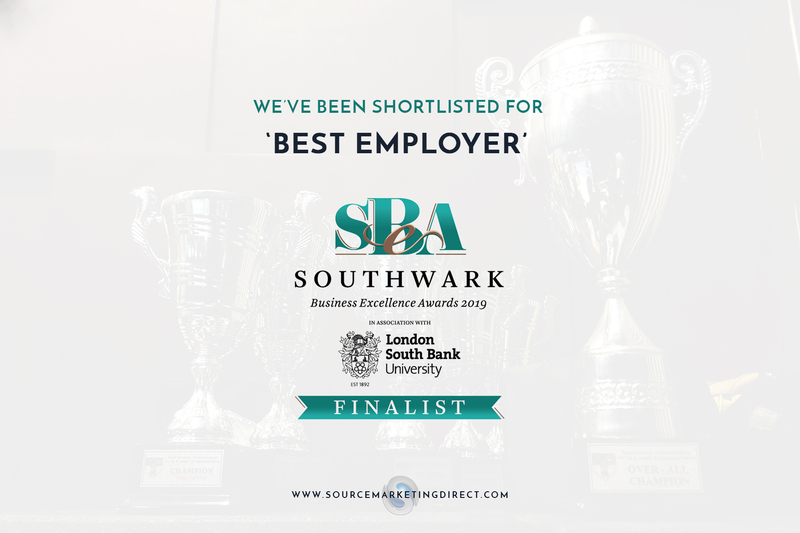 We’re thrilled to announce that we have been shortlisted for ‘Best Employer’ at the 2019 Southwark Business Excellence Awards. Our nomination is the first step towards attending the Gala Dinner & Awards Ceremony that takes place on Thursday 13th June at the Hilton London Bankside – a venue we are very familiar with for hosting industry seminars with some of our rising stars and young entrepreneurs. Over the last 10 years in business, our Managing Director Hector Montalvo has obviously seen many people join and some leave the Source family, but one thing that stands out for him is how the vast majority claim to have been left ‘better off’ both personally and professionally after spending time with us. “We’re very proud to have our name in the hat for the ‘Best Employer’ category again this year. We strive for excellence in every aspect of our business, and the nomination is an external validator that says we’re not far off what we want to be known for in the community – and shows last year’s nomination wasn’t a fluke!,” comments MD Hector Montalvo, in jest. As anyone who’s met Hector will tell you, he is a passionate advocate for continuous professional development – and his public speaking engagements are centred around this topic. He’s spoken everywhere from Chicago to Cape Town on the subject, and wants us to carve a niche in London’s sales & marketing scene through the opportunity we are able to offer those with varying degrees of experience. Something that we all feel strongly is falsely prioritised in comparison to traits such as ambition and mindset. We attribute the back to back nominations to our team – without them, we would not have been able to foster an environment for learning that allows our people (and culture) to grow every day. We eagerly await the second round of judging. May the best business win! Source Marketing Direct: Get stuck in execution mode. Why we love being based in Southwark, London. We're always on the look out for ambitious, motivated and highly driven young professionals with an interest in sales, marketing and entrepreneurship to become a part of our ever-growing company!